Joseph Garwood McCoy, age 99, passed away peacefully on April 3 at Westminster Village, Allentown. He was predeceased by his loving wife of 74 years, Ruth M. McCoy. He was a longtime resident of Hellertown and Bethlehem and an active member of Mountainview Moravian Church. Joe was employed at Bethlehem Steel until he joined the U.S. Army to serve in World War II. He rose to the rank of Master Sergeant and served in the Army until 1952 and the Army Reserves until 1979. He spent a career in the life insurance profession and kept busy in his post-retirement years as a bus driver for Saucon Valley School District and as a volunteer for St. Luke’s Hospital, AARP 55 Alive driving classes and other charities. But he loved nothing more than spending time with his family and treasured his role as a father, grandfather, great-grandfather and avid patriot. Although he often hid his soft side, his caring nature was evident to those closest to him and clearly shown during his wife’s and sister-in-law’s long illnesses. 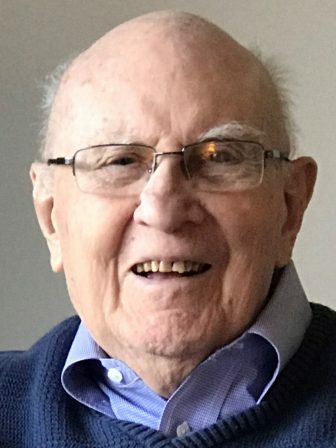 While at Westminster Village, he enjoyed his involvement in plays and his roles as brownie baker and “poet laureate.” His enthusiasm for life even at 99 was infectious. His son, Les McCoy (Barbara) of Easton; two daughters, Jeanne Giampetro (John) of Bethel Park, Pa., and Carol McCoy of Richmond, Va.; four grandchildren; and eight great-grandchildren. The family thanks Nancy Price of Easton for the enduring friendship and loving support given to both Ruth and Joe. A celebration of life will be held at Westminster Village, 803 N. Wahneta St., Allentown, on Saturday, May 4 at 10 a.m. Interment at Indiantown Gap National Cemetery will be private. Arrangements are by the Heintzelman Funeral Home Inc., Hellertown. In lieu of flowers the family requests that donations be made to Mountainview Moravian Church, 331 Constitution Ave., Hellertown, PA 18055.